← Pinaka rockets successfully test-fired from multi-barrel rocket launcher. This, from its January 16 2013 newsletter. 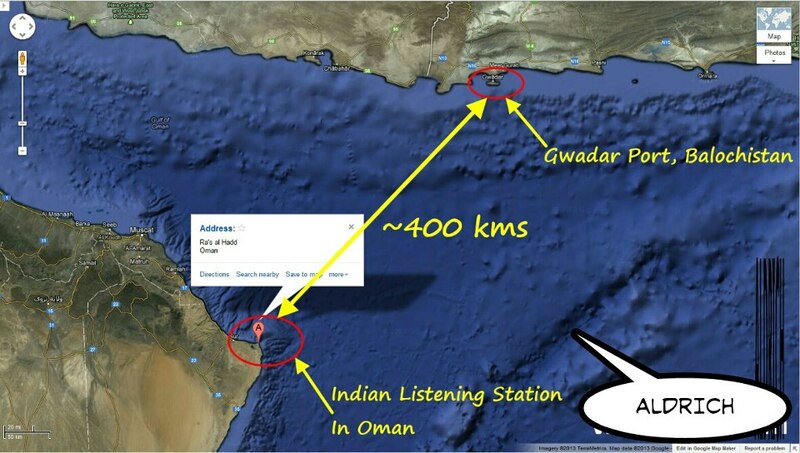 As seen from the Google Maps image, above, the Indian listening post is practically a front door neighbour [~400 kms] to Pakistan’s Gwadar Port, one that it wants China to develop into a major Naval installation, among other fantastical longings. If plans for such a base, located in a province that has been waging a struggle for its independence from the existing Pakistani state for more than 60 years, do materialise, then India would be favourably placed to monitor the upsurge in communications emanating from there [SIGINT]. Of all the monarchies in the Middle-East, India has enjoyed an especially close & friendly relationship with the Omani kingdom. Besides periodic joint military exercises, involving all 3 branches of the Armed Forces, Oman has also granted it berthing rights for Indian Naval Warships to replenish its stocks & its sailors to step on land for Rest & Recuperation, during the course of long deployments away from home, an increasing trend in the Navy’s mission profile. Such an arrangement with Oman fits perfectly with the Indian Government stating the extent from the Persian Gulf to Malacca Strait being within the ambit of its ‘Area of Operation’/’Sphere of Interest’. Yet another indication of Indo-Omani relations being robust & one based on trust was the recent report which stated that the kingdom had approached India to carry out the task of fencing its International Borders with Yemen, a critical security measure to keep the kingdom safe from influence of Islamist terrorists. Despite these gains, the relationship holds potential for a lot more, especially given that one sits on major energy reserves & the other is an even greater consumer of it. Relationships wrapped around Carbon – diamonds, oil alike – the strongest. “China’s floating facilities – Although it is trailing behind in the Arabian sea listening post race, China is nonetheless working iall out to install permanent interception facilities in the region. Chinese specialists now support Pakistan and Iran’s intelligence services, however these only have very limited interception capacities. To boost its presence in the region, the 3rd Department of the Chinese People’s Liberation Army, which is in charge of interception, is working to develop its ties with countries such as Djibouti and Kenya, however this has yet to produce any concrete results. Beside the above listening post, India has long been helping nations in the Indian Ocean Region [IOR] set up security infrastructure, and providing military hardware. Besides the additional SIGINT stations planned in other countries, as stated above, India has also completed the task of linking up its coastal radars on its West coast, with those it has installed on each of Maldives’ islands. Similar inter-linking plans with Sri Lanka & Mauritius are also to be implemented. The Armed Forces have also regularly been engaging in joint military exercises with them, besides imparting training. In addition to these, the Navy & Coast Guards also assist by carrying out hydrographic surveys & maritime surveillance of their EEZ. The Indian Navy has been deputing its officers to help manage Mauritius’ Coast Guard’s operations. Militarily India has a distinct advantage, by a comfortable margin, over China which is seen to be earnestly trying to gain a foothold in the IOR. Understanding the challenges such developments pose to Indian interests & concerns, it is absolutely imperative for India to leverage & strengthen its long-standing relationships with nations in the IOR, guarding against any unwarranted ingress. Developments over the past few years do indicate that the Indian leadership is wholly cognizant of this fact and has been seen taking measures to address these, though the pace at which it seem to be occurring leads one to conclude that there could be ample scope for improvement in the effort. Posted on March 1, 2013, in Cyber warfare, Geo-Politics. Bookmark the permalink. 1 Comment.